Shoulder injuries are some of the most common injuries in football. In fact, hand, ankle, and knee injuries occur more often in the sport. Among shoulder injuries, an AC injury, or acromioclavicular joint injury, is one of the most common. 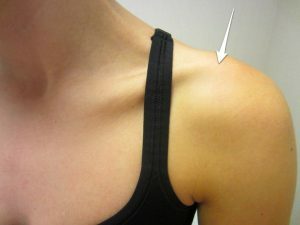 The AC joint (white arrow) can be felt on the top of the shoulder between the end of the collarbone and the tip of the shoulder blade. The AC joint is the small joint on the top of the shoulder between the end of the clavicle (collarbone) and the acromion (tip of the shoulder blade). An AC injury usually results from an athlete landing directly on the shoulder or being hit directly on the shoulder. It isn’t surprising then that football players would suffer them. They range in severity from sprains or mild separations to significant separations between the bones in various directions. Almost a decade ago, Bryan T. Kelly, MD and others published a landmark study on AC joint injuries in football. They looked specifically at NFL quarterbacks. The authors found that shoulder injuries were the second most common injury type suffered by quarterbacks. AC joint injuries specifically were the most common of those shoulder injuries. Since an AC injury is common for a football player, further examination into the severity and frequency of these injuries at various positions is warranted. A study published online last week in the American Journal of Sports Medicine offers that information among all NFL players. 8.2% of the injuries in these 12 NFL seasons were shoulder injuries. 81.5% occurred during games versus only 18.5% during practices. Quarterbacks had the highest incidence rates of AC injuries among players at any position (20.9 injuries per 100 players). Based on overall numbers, though, defensive backs and wide receivers suffered the most AC joint injuries. Only 1.7% of the AC joint injuries required surgery. The mean time missed due to an AC joint injury was 9.8 days. 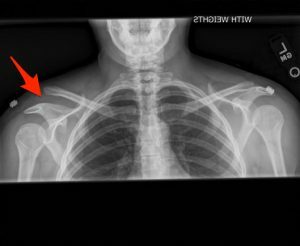 This x-ray shows a Type V AC separation (red arrow) of the right shoulder. Note the normal alignment of the clavicle and the acromion in the left shoulder. The part of this study that I found most surprising was the low percentage of AC joint injuries that ultimately required surgery. That low percentage (less than 2%) could be explained by the fact that no Type IV, V, or VI AC injuries were reported over those 12 seasons. Those high-grade injuries require surgical reduction and stabilization. The injuries that most often required surgery were Type I and II injuries. Distal clavicle excision, or cutting off the end of the collarbone, is often performed for chronic pain that occasionally results from these milder AC joint injuries. As the authors of this study suggest, distal clavicle excision could have been the most common surgical procedure in those NFL players for that reason. Making football practices noncontact instead of contact has been proposed at various levels mainly to decrease head impacts and concussions. That change would decrease the risk of an AC injury simply by cutting down on the players’ shoulder contact with the ground or with another player that causes them. However, since over 4/5 of AC joint injuries occur in games, it might not cause a significant decrease. Since quarterbacks have the highest incidence rate of AC joint injuries, protecting them from getting hit in practices or scrimmages might be a good idea. Decreasing these injuries much more will probably be difficult without seriously changing the nature of the tackling, and that is unlikely to happen. Maybe better shoulder pad technology can provide additional protection in coming years. Regardless, football players and coaches need to understand these injuries and have their athletic trainers and team doctors evaluate them to get them back on the field quickly. Lynch TS, Saltzman MD,Ghodasra JH, Bilimoria KY, Bowen MK, Nuber GW. Acromioclavicular Joint Injuries in the National Football League: Epidemiology and Management. Am J Sports Med. Published online before print September 20, 2013. Kelly BT, Barnes RP, Powell JW, Warren RF. Shoulder injuries to quarterbacks in the National Football League. Am J Sports Med. 2004;32(2):328-331. Are 2 extra games worth the increased injuries?